What I found was No-Knead Pizza Dough. I have yet another confession to make—all of my bread is “No-Knead.” I will be up a creek if my Kitchen Aide with my dough hook ever dies. The recipe said to mix it all up with a spoon. Too much work—I used the Kitchen Aide. The original recipe called for 7 1/2 cups of flour and made something like six pizzas. I halved the recipe for just the two of us and I also reworked the directions to include my dough-hook! Place the dry ingredients in the bowl of a stand mixing and using a hand whisk, combine. Place mixing bowl in mixer and add the dough hook attachment. With the mixer running, add the water. Mix until incorporated. 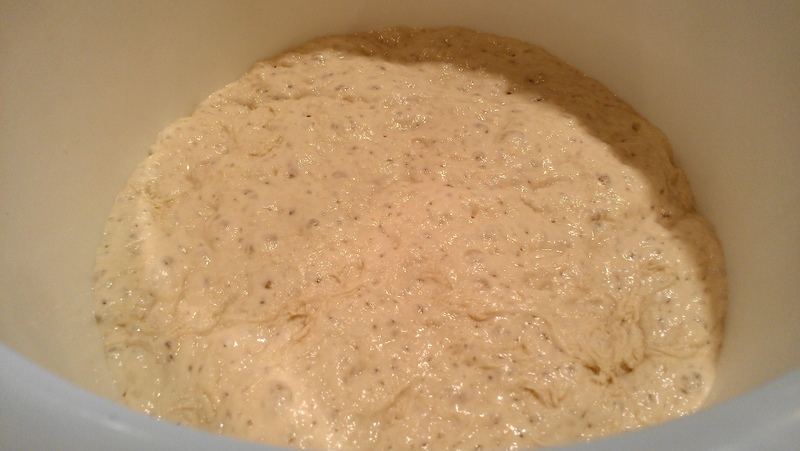 I was really amazed that this dough had so many bubbles the next day. 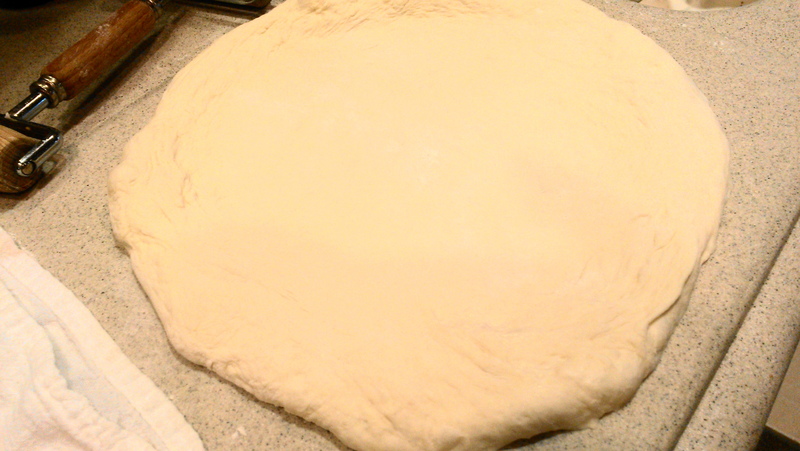 Transfer the dough to a floured work surface and divide unto two portions. Knead each dough briefly and form into balls. (Dough is VERY sticky so you will use some more flour here.) Dust dough with flour, set aside on a floured baking sheet. Repeat with remaining two portions. Cover with a damp kitchen towel. Let dough rest until soft and pliable about 1 hour. After dough has rested, work with one dough portion at a time, dust dough generously with flour and place back on floured work surface. Shape into desired shape. This is a very pliable dough. Since (of course) I am still on our Clean Out kick, I used what was on hand for our pizza toppings. This recipe should make three pizzas, but I made two. 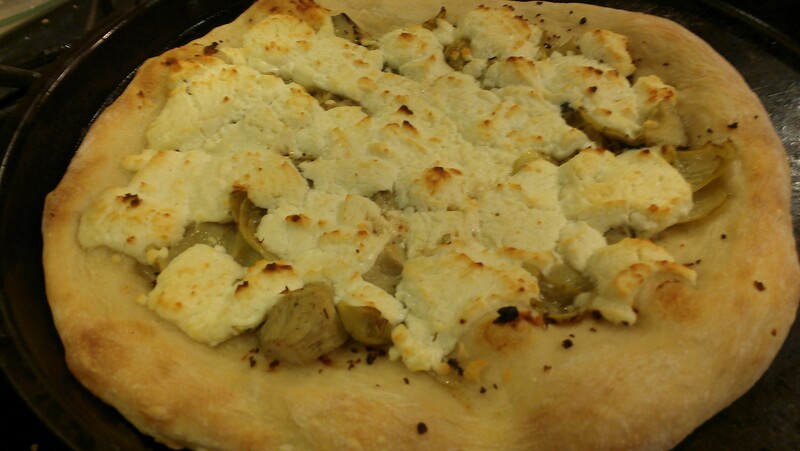 I made a traditional pizza for The Hubs and a not-so-traditional one for me. I found some German sausage in the freezer that I had bought on a whim from our local meat vendor/family farmer. It is a bulk sausage and has a very mild and fresh taste. In fact, I think that pepper might have been the only seasoning. I browned it up, topped it with cheese and threw some Pomi tomatoes from the pantry on top. 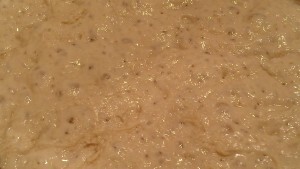 I really liked this pizza dough, one that I think would be classified as a New York Style crust. It was crisp on the outside but chewy and soft. I really enjoyed the taste as well. Hubby? Not so much. He is a pizza traditionalist. What can I say? Don’t mess with his tried-and-true, old fashioned, expected pizza crust. 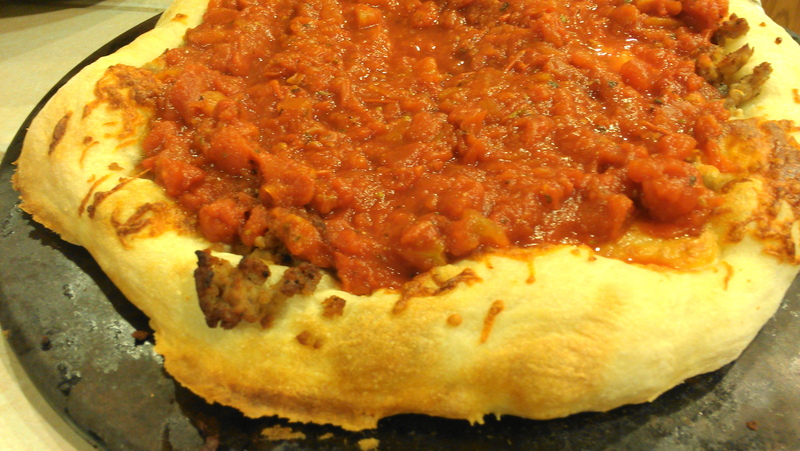 For other pizza and pizza dough ideas, click here. I don’t own a KitchenAid, but that’s ok since I’m one of those people who thinks kneading bread is therapy. I’m going to get this going today so we can have pizza for lunch tomorrow. It’s too easy not to do! And, since we’ve been talking pizza together, it’s on my mind now. Have you seen the latest issue of Fine Cooking? It has a whole section on pizza. It always amazes me how many food bloggers do not have a Kitchen Aid stand mixer! Once you get one, you never go back. I have been deliberating about a permanent pizza stone in my oven if it would cause problems with other baked goods. Anyhow, special equipment or not, I will need to try out this pizza crust-I think I have strayed away with too many specialty pizza crusts, so it will be nice to get back to basics. Also, thanks for the link to other pizza ideas! I am making this again! I think if I can crisp up his pizza a bit it would help. Gotta get that oven hotter! WHAM! Pizza craving! I’d better eat breakfast before I try to eat my screen. (I know 2 pm is late for breakfast, but that’s how I roll, lol–I’m a late riser.) I love the sound of this dough. oh, the craving. Your toppings are great! Love the lack of effort of kneading this requires yet still gives such wonderful results! No-Knead pizza is a staple in our house. We have it at least 2 times a week. If you make the whole recipe you can freeze the excess dough balls. They defrost on the counter overnight nicely…If you chill the dough for an hour before stretching it out you will get a thinner crust pizza. Great tip, Chef Connie. Thank you. The Hubs is all about thin crust and as you can see from the pictures, this crust was thick and chewy (which I liked a lot). I will chill part of it next time. 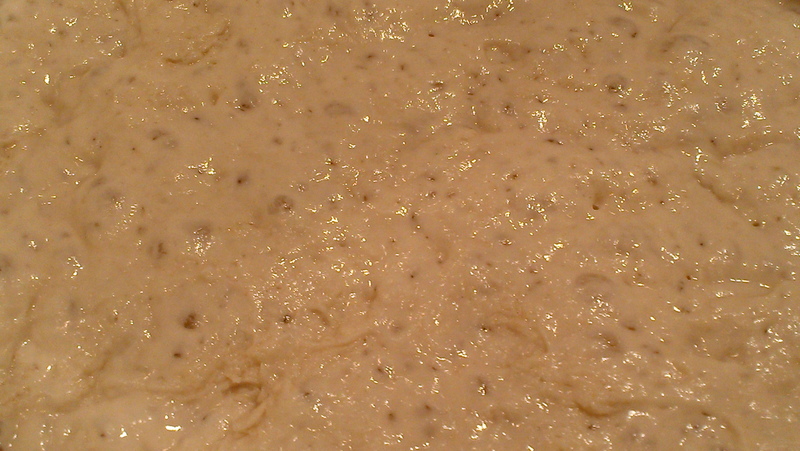 I’m actually making my own pizza dough today for a pizza tonight. I’ve never strayed, since it’s my dad’s recipe and it’s like a mandatory thing to make it. I think I’m going to need to make this! Gorgeous and delicious looking! Well, definitely don’t make the family grumbly with the change. Blame it on me if you need to Jen. I’ll take the heat for you. I’ve had my KA for almost 20 years now and if I can get away with using it versus hand mixing/kneading I do it! I love the artisan bread that sits over night, it gets that nice tangy flavor. I’m sure the pizza dough does also. I’m sure it’s better than the frozen pizza we had last night (side effects of repainting your kitchen). this dough looks so good! i will definitely be referring to your recipe when we do pizza sometime! You that dough-hook, baby! I am the no-knead queen!